Danger, Will Robinson! OK, now that we’ve got that out of the way, let’s enjoy a nice little reunion between two Lost in Space veterans (except they never actually share the screen) and learn the “finer” parts of Centauri physiognomy (“finer” is not meant literally). 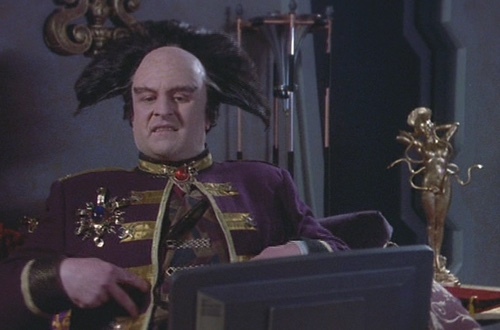 It’s a legal medical thriller and a barroom brawl thoroughly inhabiting the category, “It’s Better Than I Remembered It.” It’s “The Quality of Mercy,” up this week on The Audio Guide to Babylon 5. Lost in Space‘s June Lockhart almost-but-doesn’t-really reunites with her former space son Bill Mumy in a story about punishment, healing and innovative card tricks. Talk about it here, but please leave the spoilers in Earhart’s. Was the arrival of June Lockhart a sign and/or portent that Babylon 5 was about to turn into a comedy with anthropomorphic vegetables? (“The Great Vegetable Rebellion.” Look it up.) If not, what did “The Quality of Mercy” set up for the future? Talk about that here, not in the Zocalo.